There are many ways to pay for your drinks on a night out. You can go for low-tech cash, card or even a cheque. Or you can go the high tech route with mobile payments... but there is another way. With Drinki you can pay for your drinks with a Facebook Check In. 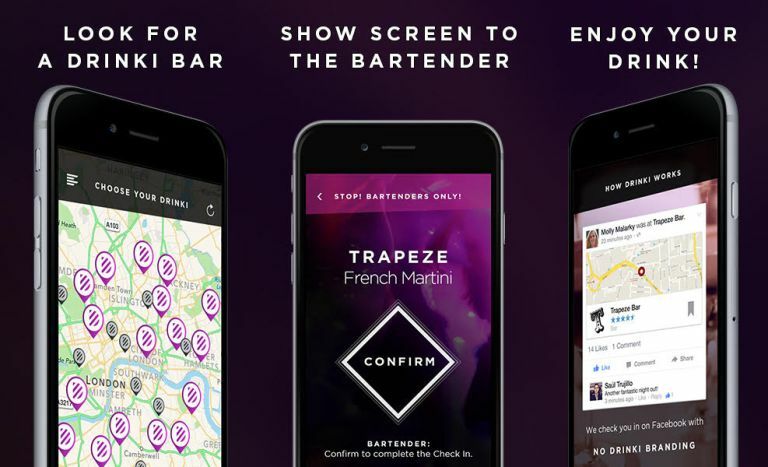 Drinki lets you swap a Check In on the world's biggest social networking site for a drink in over 70 bars spread across London, Manchester and Liverpool. And the list of supporting bars is growing too. All of the waterholes included are high-end establishments and it's not just a one time only deal either. You can pay for your cocktail with Drinki once a day. To get started you need to download Drinki for Android or iOS and login with your Facebook account. There's no need to mess around with setting up a separate account just for the app – Drinki wants to keep this simple. Once you're there, you'll get a map of all the nearest Drinki bars so you can get planning where you want to spend your evening. When you arrive all you need to do is show the bartender the app screen and Drinki will take care of the rest. From opening up your phone to getting a drink in hand you'll only need to tap your phone three times. If you're really keen for more drinks you can even share the app with your mates and for every three of them that download it, you'll get an extra drink on top. Have fun tonight, and Drinki responsibly.